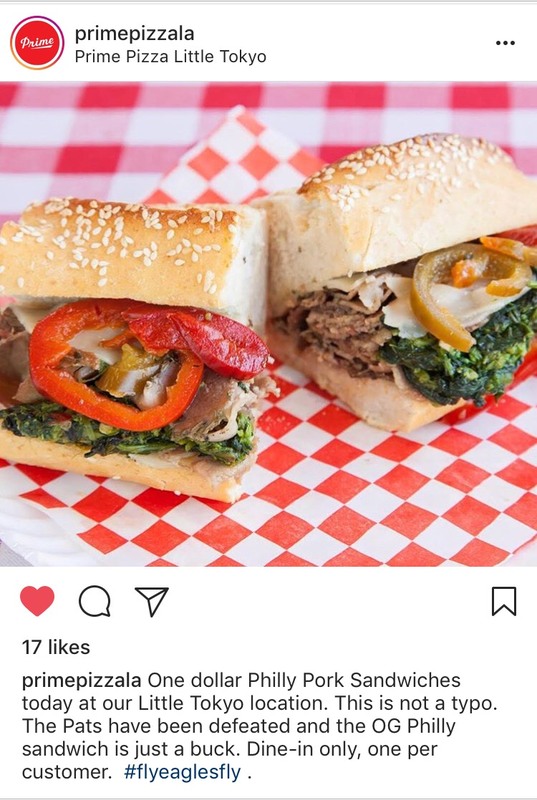 THE UNEMPLOYED EATER: Roasted Pork Sandwiches at Prime Pizza All Day For A Buck. Roasted Pork Sandwiches at Prime Pizza All Day For A Buck. Fly Eagles Fly. In celebration of last eve's Eagles Super Bowl victory, top drawer local pizza joint Prime is celebrating by offering their new'ish Philly Pork Sandwich for only $1 all day. Prime's rendition of the Brotherly Love classic comes with house-roasted pork, broccoli rabe, sharp provolone and hot cherry peppers. Offer valid only today, 2/5/18, at their Little Tokyo location. Also don't forget while you're there: Prime pumps out arguably LA's best slice. I am extremely upbeat to peruse this about the new market. It is great opportunity for open and we can likewise join this http://mightyessays.com/ composing administrations audits organization to peruse the all rates of all items. Attempt to purchase the important things.